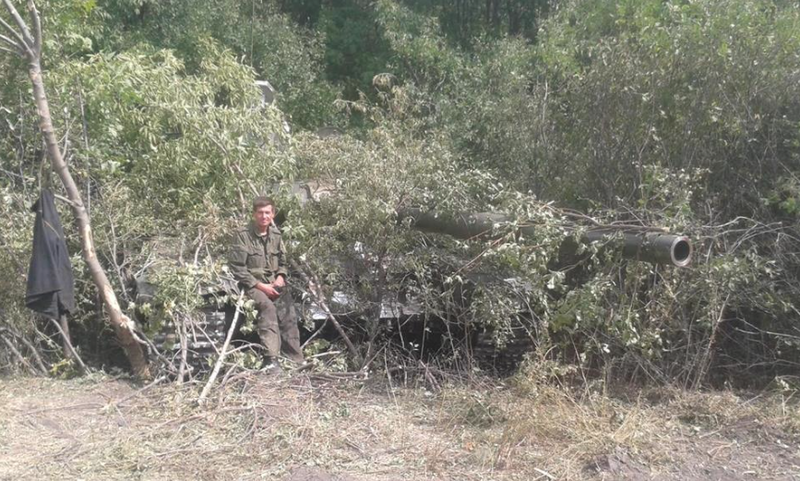 Colonel Yevhen Sydorenko broke out of the encirclement near Ilovaisk on the captured Russian tank. Chief of the Armored Weapons Service at the Operational Command “South,” Colonel Yevhen Sydorenko, who came out of the encirclement near Ilovaisk on a Russian T-72 tank, will be presented with the title of Hero of Ukraine. Ukrainian Defense Minister Valeriy Heletey announced this at a press briefing. At the briefing, Yevhen Sydorenko complained that while Ukrainian media carefully cover the problems faced by volunteer battalions, at the same time they barely highlight the problems of the regular military units of the Armed Forces of Ukraine, who carry out principal combat work at the frontlines. This entry was posted in English, English News, Languages, Media, News, Pictures, Regіons, South&Eastern Ukraine, War in Donbas and tagged #RussiaInvadedUkraine, #UkraineUnderAttack, #Valeriy Heletey, #war in Ukraine, #Yevhen Sydorenko, Ilovaisk, Ukraine. Bookmark the permalink.